As a leading conservation organization, QUWF celebrates its 10th year with a commemorative knife, made in the U.S.A. by American craftsman and American materials. The 10th Anniversary knife will only be available in 2019 through QUWF Chapter Banquets and special events across the country along with a full selection of Bear & Son knives, all helping to raise local funds for local habitat and clean stream projects. The 10th Anniversary knife comes complete with a ballistic nylon sheath. “Bear & Son Cutlery always supports the conservation of wildlife habitat, wildlife populations and clean streams. We also support youth-oriented programs, because younger generations are the future stewards of our hunting, fishing and outdoor heritage,” states Drew Kohler of Bear & Son Cutlery. 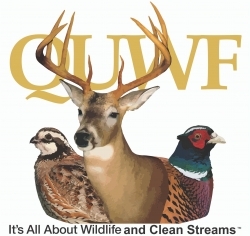 “QUWF is a great partner working toward a common goal on a national basis. Their members are hands-on and actively involved in turning-the-dirt projects that benefit our natural resources. It’s also truly an honor to join forces with a veteran founded organization, whose leader continues to give for his country with a passion and lifestyle that supports wildlife conservation in the USA. It makes perfect sense for an American conservation organization to offer Made in USA and Built in USA knives. We are very thankful and proud to be an American manufacturer and partner in conservation,” concludes Drew. “The beginning was a challenge to say the least but one conservationist helped us and that is John L. Morris of Bass Pro Shops. We honor him with the presentation of the first knife produced as it represents an American dedication to conservation, hard fought growth and continued dedication to save many species of wildlife and clean stream fisheries across the U.S.,” explains Alderman. Bear & Son Cutlery is equipped with a rich family tradition in knife making and employs a skilled and experienced work force that is capable of performing many of the extra hand operations that go into the making of their products. The Bear & Son Cutlery factory is unique. It is full self-contained. While some companies only assemble parts brought from various suppliers and put their names on the product, Bear & Son Cutlery does everything in-house from building their own blanking dies to heat treating, grinding and assembly, and hand finishing products. These steps ensure that Bear & Son Cutlery is of excellent quality and a real value for both the retailer and consumer. Their ongoing commitment is to make them in America and make them affordable.